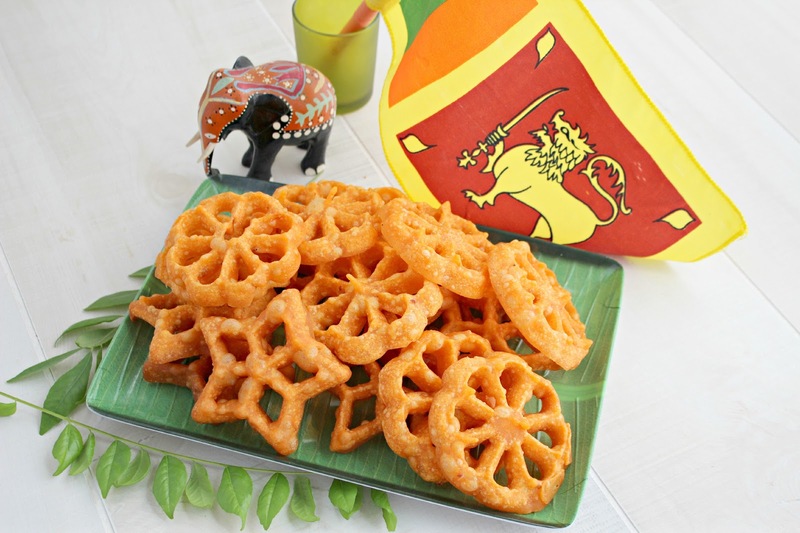 A few months back I made traditional Sri Lankan Kokis (a dish that is made by deep-frying a batter of rice flour and coconut milk). 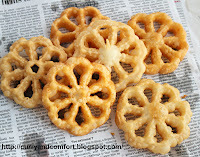 My mother said she had some fantastic kokis in Sri Lanka that had red chili powder in the batter to make it very spicy. 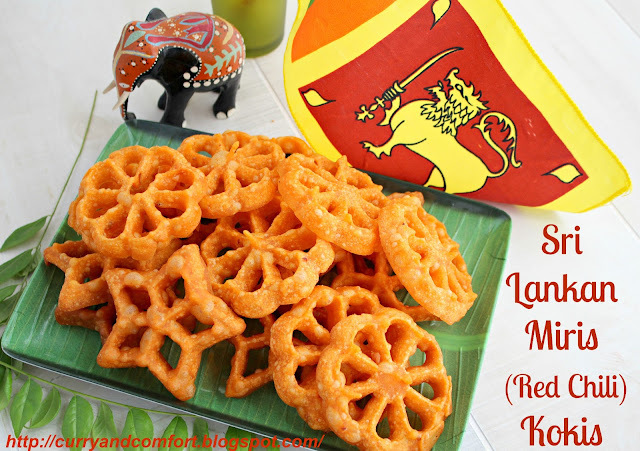 I never tried spicy kokis so we set out to make some and I was in love with them from first bite. These kokis are bright orange in color (compared to the light golden of the traditional kokis). The color comes all from those lovely chilies! It makes my mouth water just to look at these and remember the spicy kick they had. My mother had the traditional kokis molds to make them, but I had just bought a Scandinavian set of rosettes that reminded me so much of the kokis molds. I was keen to use them and they worked out great. If you are interested in finding these molds this is the name of them: Norpro 3286 7-Piece Cast-Aluminum Rosette/Timbale Set and they are readily available online. Please note: I am not affiliated with this company, but I do recommend them since I have used them successfully to make kokis. 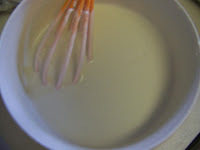 a thick "pancake" like batter. Heat oil (only halfway up a deep fryer) until about 350 degrees. Allow mold to sit in only for 30-45 seconds to get nice and oily. Dip mold into batter carefully. 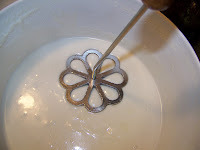 You don't want the batter to get onto the top of the mold or the kokis will not release from the mold in the oil. 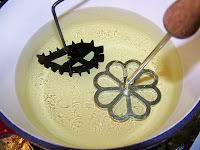 Dip battered mold into the oil and hold for a few seconds. Then gently jiggle the mold until the kokis releases from the mold. Fry until golden brown. Drain on a paper towel and repeat the process. This will make about 25-30 kokis. Enjoy. 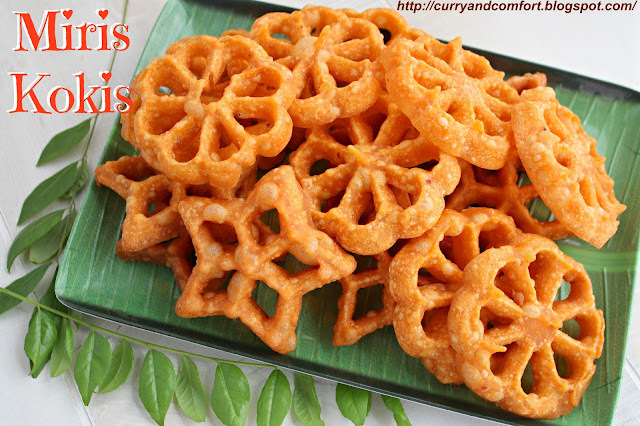 Spicy kokis sound an addictive snack. 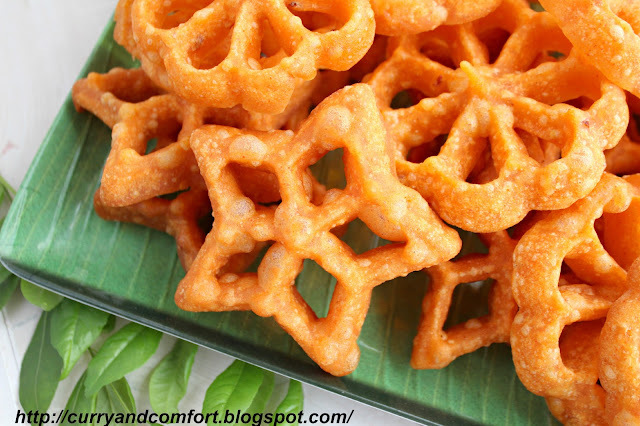 I had a sweeter version of something similar that my husband brought from a south Indian state. I love these kokis! Need to add the molds to my to-get list. Hope you had a wonderful 4th of July, my friend! they are beautiful,never tried the savoury version.looks fantastic. I am always down for something spicy! Looks like I'll be checking your online source for this molds because I want these kokis! What a delicious spicy crunch! 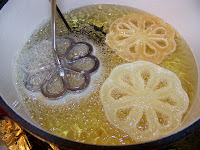 I was just thinking how much these looked like rosettes! I've had the irons for years...and now I have a savory option to make with them. So beautifully done, Ramona! These look like fun! I can't wait to get a rosette makerand get started. These are gorgeous! I have never seen these before, but I would love to make them. A cool snack with a spicy kick, my kind of snack! Great post! Chili pepper contains a great rundown of plant determined substance aggravates that are known to have ailment forestalling and wellbeing advancing properties. I think red chili wholesaler says advantage and disadvantage of red chills to customers.